Monitoring, progress review, reassessment and evaluation refer to activities aimed at determining the progress of the patient’s illness during the entire care episode. To be useful, the terminology need to be differentiated and clarified. If no treatment has been given, the values obtained represent disease progression according to the natural history of the disease and will help in the determination of diagnosis. If therapeutic interventions are performed (procedures done medication is given), they indicate effectiveness or otherwise and the possibility of the side effects or complications. From a Quality management perspective, these are Quality Control procedures. Monitoring is the performance and documentation of planned serial measurements at regular intervals. ‘Monitoring’ is a better term than charting or observations, often used by nurses. The purpose is the detection of change or lack of it, rather than a mechanical process of measurement and recording. These information and results are interpreted by comparing them with the condition at the first visit and the objectives set to determine progress. Evaluation is the process of integrating all information regarding the patient followed by the determination of the conformance to the care plan, the effectiveness of the treatment, the potential risks followed by consideration of the alternatives to the next course of action. It requires the care provider to derive conclusions and make decisions on the necessity to change the care plan. Evaluation is performed at relevant milestones of the care episode. 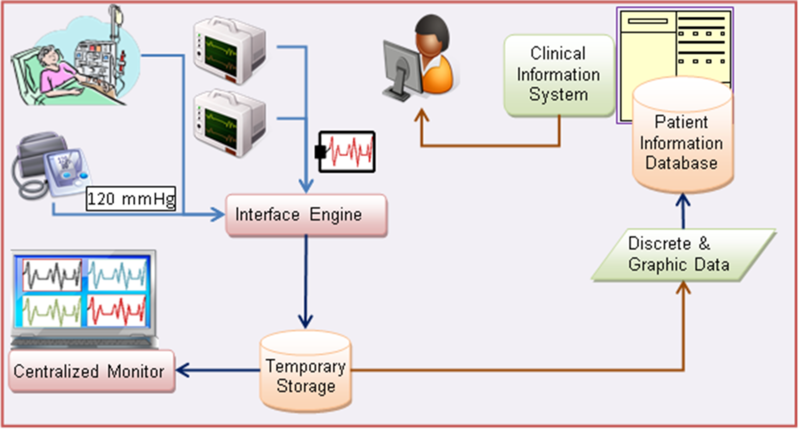 These steps are summarized in the generic patient care workflow shown below and are discussed in further detail. Monitoring is the performance of planned serial measurements of certain parameters at regular intervals. The results or values are then documented in the form of tables or charts. Monitoring as a whole need to be performed from the beginning of care and should end only if the disease is considered cured or care has been discontinued. The determination of what parameters to monitor depends on whether they serve the purposes mentioned earlier. Their selection is based on several criteria/aspects and for each criterion, a parameter and an appropriate method of measurement is used. With regards the illness, the changes can be for the better or for the worse. The disease itself can improve on its own accord, consistent with its natural history. Some diseases may abate but has the potential of recurrence. Treatment can result in a favorable outcome or in untoward effects. 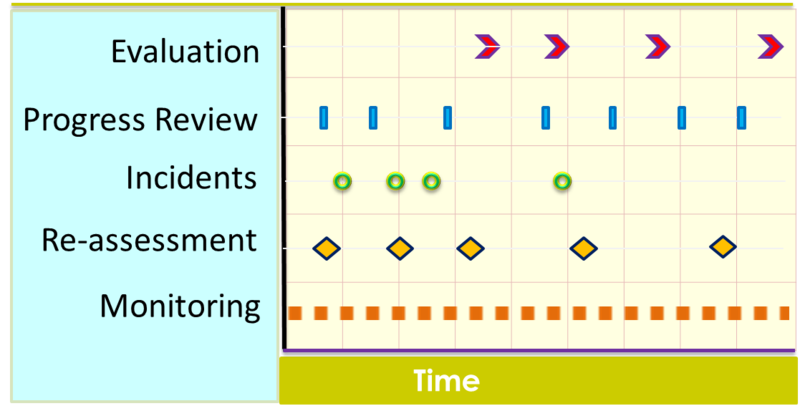 From an operations management perspective, monitoring is one of the methods of process control. From time to time measurements of certain parameters may be discontinued if it is no longer useful e.g. patient has become stable, and other parameters may be measured instead. Reassessment using diagnostic studies such as endoscopy etc. Measurement a parameter is made using a method and quantified as a value according to a unit of measure. Care providers may observe, measure or count the frequency of symptoms, signs and physiological parameters using just their five senses or simple measuring instruments. For symptoms, the care provider may inquire of patients regarding what they feel and make a judgement. Otherwise, the patient can be asked to make his/her own judgment based on gross scales such as mild, moderate severe, same/less/more, or use a subjective scale e.g. Likert scale (e.g. Pain score). For certain signs, regular observations can be used as a monitoring tool (e.g. Glasgow Coma Scale) or simple instruments can be used (e.g. sphygmomanometer, shining light on the eyes etc.). Measurements of each parameter are recorded usually in the form of a table or chart. Use of modern (often miniaturized and computerized) instruments results in the expansion of the types of parameters that can be monitored in the clinical setting. For example, the ECG pattern, Oxygen saturation levels, core body temperature and even intracranial pressure can be now be monitored. Many of the automated methods are invasive i.e. require the placement of sensors within body cavities and therefore incur certain risks. Results from machines are displayed on LCD/LED individual monitors at the bedside or combined on a centralized monitor. The values still need to be recorded on charts manually. However, if they are interfaced to a Clinical Information System, the results can be captured automatically in the Patient Information Database and made available to care providers as appropriate views (tables and charts). Each parameter can be shown as graphs to indicate trends and also different parameters can be compared to show associations. The frequency of measurement of a parameter epends on the available measurement technology. The time taken to perform the measurement and obtain a result would limit the interval between measurements. For blood pressure measurements, the non-invasive method using a cuff and detection of turbulent flow would take at least 1-2 minutes even if a machine is used. Furthermore each time the cuff is inflated blood flow to the extremities is impeded. Therefore a frequency of less than 15 minutes is probably not desirable. However if a system consisting of an indwelling arterial line, a transducer and a monitor is used then a measurement for each systolic and diastolic period is possible. Technology is now available to measure some biochemical tests (e.g. blood sugar level) without the need to send samples to the laboratory. Baseline measurements provide the value on which comparisons are made. This baseline value has different connotations for different patient types. For a patient with an acute illness the baseline values represent the condition of the patient at the time of seeking treatment. It gives an idea of the severity and stage of the illness. If these values changes towards normal, it would be interpreted as an improvement in the patient’s condition. Changes in reverse would represent deterioration. In patients with untreated chronic illnesses, the baseline represents the stage of the illness and the complications of the illness that have occurred. For a patient on treatment it represents the degree of control. For a healthy individual undergoing an intervention (e.g. surgery or drug therapy), an initial measurement marks the baseline status of functions that can be affected later by the intervention. It provides evidence whether a problem already exists or occurred only during or after the intervention. Baseline measurements can be made at the time of assessment and clerking by various care providers. Quite often however, a nurse starts a monitoring chart and measures the baseline parameter as the first entry. Symptoms, signs and syndromes not previously not previously anticipated and monitored. Symptoms, signs and syndromes not previously anticipated may be related to the patient’s illness or may herald the development of another illness or the complication of investigation and treatment. Common examples include seizures (fits/funny turns), fainting spells, unexplained pain, difficulty in breathing and transient paralysis. Once discovered, such incidents should be monitored to determine whether it is an isolated occurrence or a recurrent phenomenon. Mishaps, errors of clinical procedures and processes and complications investigation and therapy reflect on the quality of care. Their occurrence should be documented. Reports should be made to the immediate and overall supervisory staff. Immediate steps should be taken to minimize detrimental effects on the patient. Such incidents should be investigated to determine causes and prevent further occurrences. The first is especially relevant if the diagnosis remains uncertain. The second enables the natural progression of the disease and the response to therapy to be determined based on a more cogent set of parameters from that that used in monitoring. If the initial pathological status (severity, extent) of the illness is determined initially through endoscopy, imaging or immunological tests, then these need to be repeated to assess the degree of change. Investigations therefore are also tools for assessing progress (besides the main role of determining diagnosis). In a severe acute illness, progress review need to be done very frequently until the patient becomes more stable. In this situation, the patient undergoes resuscitation and continuous monitoring is performed. The care provider is usually by side of the patient and reviews the progress as and when parameters change. Review has to be frequent because the patient’s condition deteriorates or improve rapidly. Potent drugs given and invasive procedures performed, as part of treatment, provoke major alterations in the patient. Besides constant monitoring, intervention need to be adjusted according to the patient’s progress. Evaluation is performed at relevant milestones of the care episode. These milestones are points where a significant change in the progress of the patient is expected. Success or failure of patient care is dependent on making the correct diagnosis, deciding on an effective care plan and ensuring that the plan is followed. Besides relying on diagnostic investigations to determine diagnosis, evaluation helps to assure the the care provider on the accuracy of the diagnosis. The evolution of parameters being monitored and the response to treatment gives an indication on whether the care is on the right track. If there is doubt regarding the diagnosis hence the direction of intervention, efforts have to be made to clarify the diagnosis further. On the other hand, if the diagnosis appears to be certain, evaluation helps to indicate whether the appropriate care plan has been designed or chosen. This conclusion can only be made if it is certain that all the intended contents of the care plan have been provided and performance of various processes has been done according to requirements. If this proviso is met, then consideration must be made to decide and commence on an alternative care plan. Even though the terminologies used if fairly different, all the care processes discussed in this article, corresponds to activities of Quality Control. Values of parameters monitored, findings at progress review and conclusions made at evaluation give n indication of the intermediate outcome. The result of the final evaluation (at he end of the care episode) signifies the final outcome of the entire service for that individual patient. This should be documented explicitly so that the achievement can be compared with known standards for patients belonging to the same group (a population). The subject of Quality Control is discussed in a separate article.